Specialized Geriatric Care Focused Toward Returning Home. UMC's Acute Care for the Elderly (ACE) nursing unit is an all-private, 29 bed inpatient facility designed for elderly patients with acute illnesses. The ACE team diagnoses and evaluates medical conditions for patients 65 plus that include: Polypharmacy, Alzheimer's Disease, Dementia, neurological problems, gait disorders, fall risks, incontinence, constipation, and other complex medical issues. A specially trained multi-disciplinary team of health care professionals led by a Geriatrician include Board Certified Specialists (Cardiology, Orthopedic, GI, Neurologist, Oncology) Registered Nurses, Occupational and Physical Therapists, Registered Dieticians, Case Managers and Social Workers focused on improving their patient's functionality and mobility prior to discharge with the goal of returning them to their home. UMC's ACE unit is El Paso's first NICHE designated (Nurses Improving Care for Health System Elders) facility focused on geriatric nursing skills and training to provide compassionate care and attention to senior's unique needs. Funded by University Medical Center Foundation, "A Matter of Balance: Managing Concerns about Falls" is a program designed to reduce the fear of falling and increase the activity level among adults 55 and older. Congratulations to the following who made "A Matter of Balance" possible. 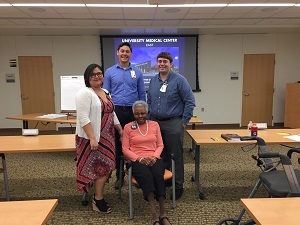 Clockwise: Mrs. Davey Johnson, instructor (seated), Blanca R. Ornelas-Delgado, Clinic Nurse Supervisor, Joshua Tovar, Healthcare Intern and David Kyle, Healthcare Intern. For more information on the four-week course, contact Joshua Tovar at 915-799-1580. Donors interested in making a gift or more information on ACE opportunities that impact our community's most vulnerable seniors can email donate@umcfoundationelpaso.org or click here to donate now. Foundation volunteers provide amenities and special support to ACE patients and families. To learn how to become a volunteer, email volunteer@umcfoundationelpaso.org. Donate here. Entirely funded through University Medical Center Foundation, the Healing Arts Program integrates dynamic and inspirational art from local and regional artists in every area of the hospital including the ACE Unit, improving the hospital experience for patients, families and caregivers.